TV programmes which are only broadcast online to UK audiences are to be eligible for 2014's Bafta's TV awards. 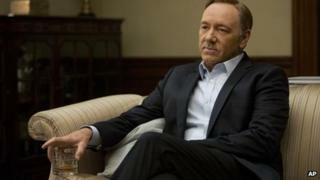 US-made shows such as Netflix's House of Cards and Breaking Bad will only be eligible for the international award as well as the audience award. Bafta said the changes reflect "trends among the viewing public" for watching shows not broadcast on TV. The academy added that the change ensured the awards would "remain relevant". The widely expected move by Bafta brings its TV awards criteria more into line with the US Emmys in the area of online viewing. But it doesn't go as far as America's biggest TV awards show in other areas. As long as programmes are broadcast online, on network or on cable TV in the US, they're allowed to compete in the appropriate Emmy categories. So this year saw ITV's Downton Abbey, transmitted in America on PBS, up against the likes of Mad Men and House of Cards for outstanding drama. The ceremony also saw Downton's Hugh Bonneville and Michelle Dockery taking on US talent in the big acting categories. But the Bafta TV awards remain primarily a celebration of home grown television. Only British programmes, or co-productions with a significant UK connection, can compete in most categories. So we won't see Breaking Bad vs Broadchurch, or Arrested Development taking on Mrs Brown's Boys. This is a primarily a rule change aimed at moving with the times in recognising how audiences consume content, while ensuring that the Baftas retain their unique character as one of TV's most prestigious awards ceremonies. "We're in a golden era for storytelling and programme-making, with top-class shows being broadcast online as well as on digital and terrestrial television," said Bafta's chief executive, Amanda Berry. "The latest update to our rules ensures we celebrate and reward the very best." The comedy programme category has been expanded in another change to the rules, and will now be called Comedy and Comedy Entertainment Programme. For 2014 it will include panel-led shows such as Have I Got News for You, chat shows and those featuring stand-up comedy to ensure "a more lively competition". Earlier this year House of Cards became the first online show to be nominated in a major category at the Emmy Awards, where it was up for for 14 prizes including best drama. It lost out to Breaking Bad, the finale of which was watched by 10.3 million people in the US on Sunday night. Bafta's changes come into force for both the Television Craft Awards on 27 April 2014 and the Television Awards on 18 May, with entry for both open from 1 October to 3 December this year. The Royal Television Society has told the BBC it will be addressing the issue in time for its 2013 awards, due to be handed out in March 2014. Should Bafta catch up with TV audiences? US senators pass a bill that would mark the most sweeping tax cuts since the 1980s.